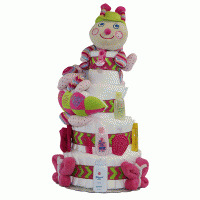 A really fantastic baby gift should be more than a few items that baby quickly outgrows or uses up. It should be something that has a lastly impact, one that is rememebered and treasured....forever! 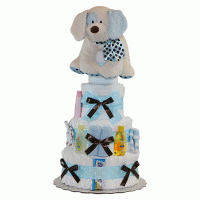 That's exactly what this attractive Diaper Cake offers. In addition to all the diapers, socks and visually beautiful gift presentation, sits a wonderful Forever Baby Book Photo Album. This is no ordinary album. The hard covered beauty holds up to 120 11" x 8.5" photo pages or scrapbook pages and includes 20 photo safe clear page protectors, 20 sheets of photo friendly paper, 100 photo corners and the most adorable bear wrist rattle for baby. In this age of digital photography and online photo storage, nothing can be more lasting or satisfying than a phyiscal photo album to remember baby's first year! 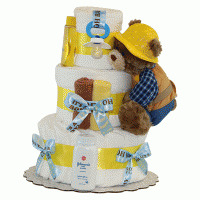 Forever Baby Book Diaper Cake also includes 78 newborn sized diapers and three pairs of socks for baby girl.